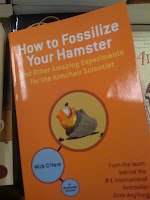 I had to take a picture of this book because it just seemed to so odd and it caught me off guard when I saw it on a table at Borders. I'm actually sort of curious to see what other topics they cover in here. Maybe I'll pick up a used copy or something.